This park was created by order of President Theodore Roosevelt on June 29, 1906, to "preserve the works of man." It is the first park of its kind. 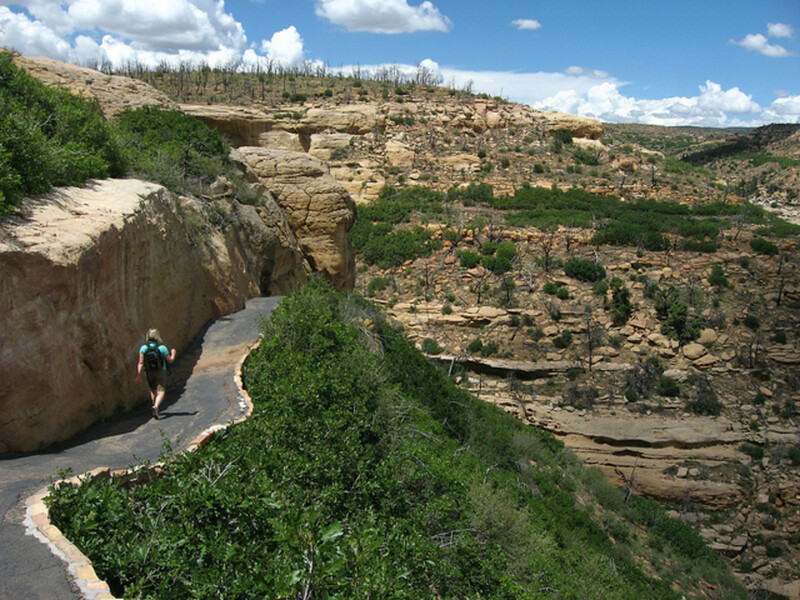 Located in southwestern Colorado, it is on a high plain with an average elevation of 7,000 feet. 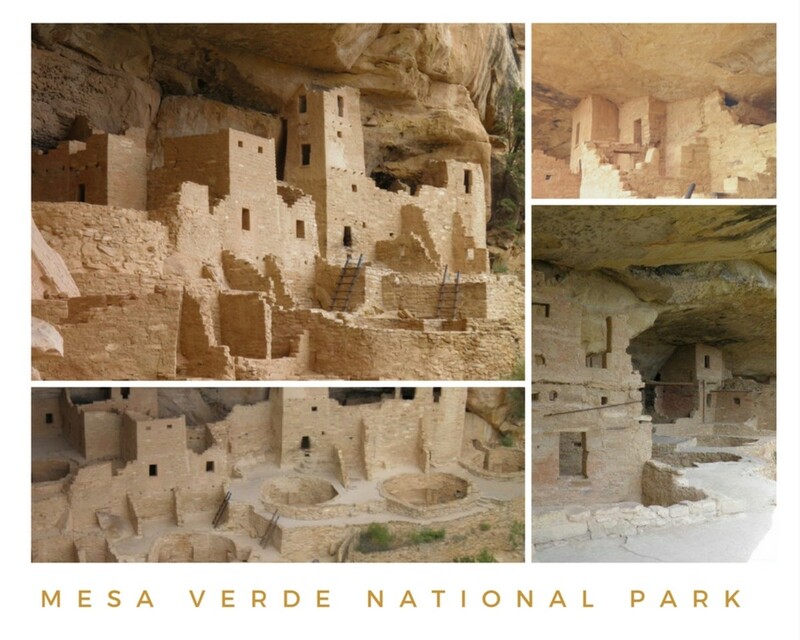 Mesa Verde National Park belongs to times so far past it predates our own history as an American People. Back beyond the Revolutionary War, beyond Christopher Columbus and Amerigo Vespucci, back before even what we regard as our own "American Indians," back, almost to the dawn of prehistory. 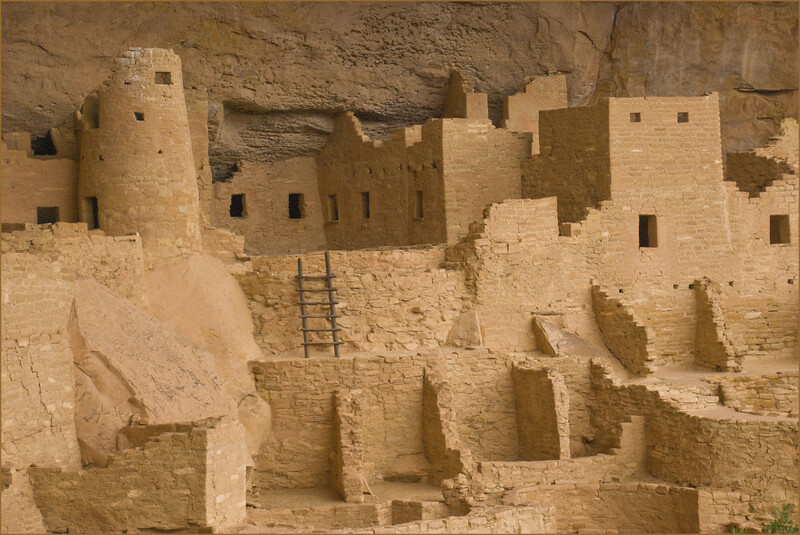 The area now known as Mesa Verde began to be inhabited somewhere around 400 B.C.E. 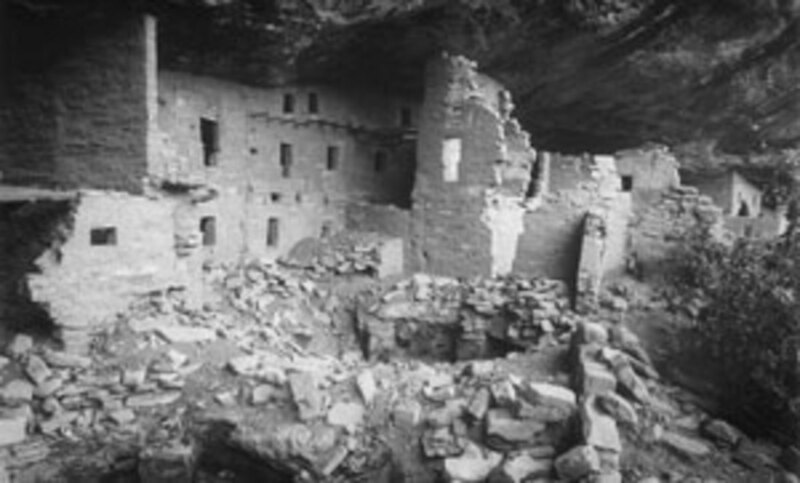 by the ancestors of the ones we now call the cliff dwellers, while the cliff dwellings themselves date back to about the 13th century. So, before many of the now famous historical events and people of the world were even thought of, there were people who had already been living here for hundreds of years. And then, one day, they were gone. Gone before any outsider knew they had existed. Gone, where no man can follow, leaving only their magnificent dwellings and a trail of enigmatic clues behind. This is the place of the fabled cliff dwellers, and it is a place of no small mystery. To probe its secrets and walk among its ruins is to experience an almost mystical kinship with earlier times and simpler folk and their ways. One walks about almost in a daze, trying to comprehend what knowledge these simple people had: an absolute oneness with nature. We call them the Anasazi. No one knows what these once proud people called themselves. 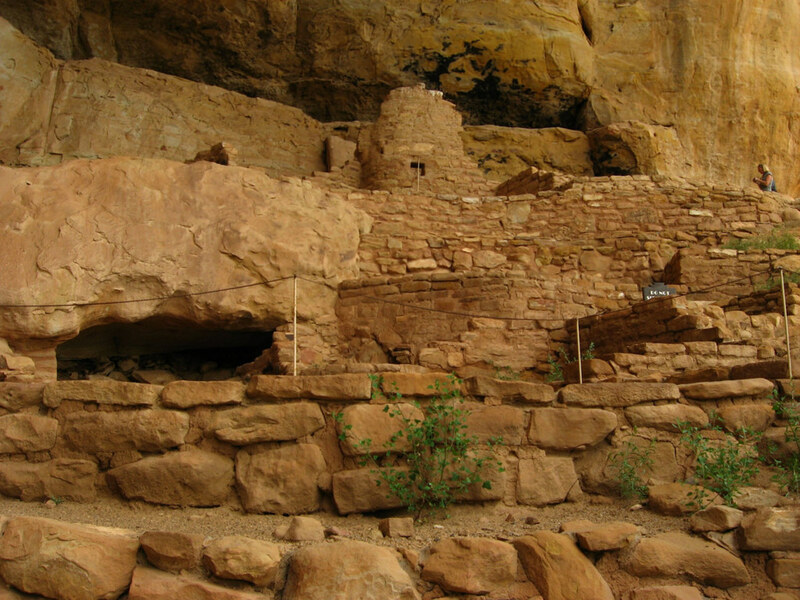 Anasazi is a Navajo Indian word meaning simply, "the ancient ones." It is generally believed that these people, or what was left of them, migrated toward the southwest and into what is now New Mexico. 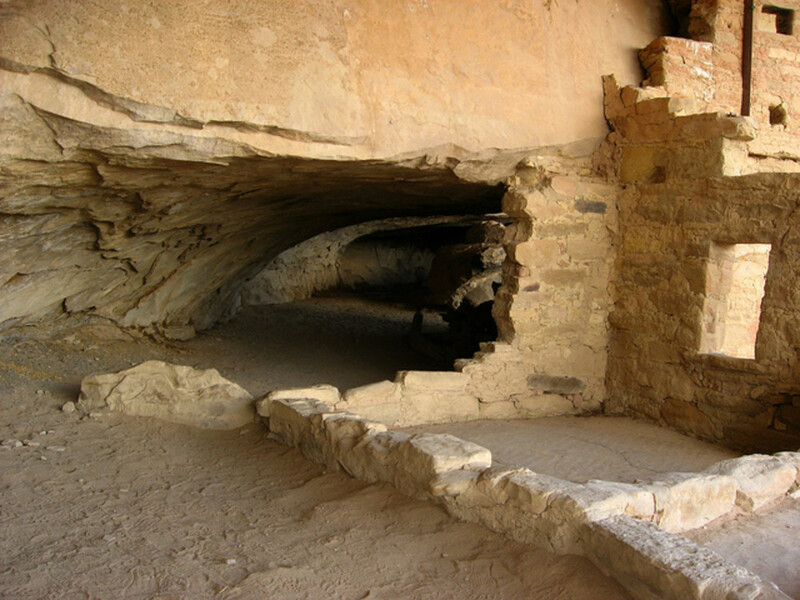 According to Park Service information, the Pueblo Indians consider the area to be an ancestral home. Walk down the nice trail to Spruce Tree House. Once inside, look up; look to the sides; in your imagination, remove all evidence of the trail down which you have just walked. Examine the sheer sides of the cliffs, the down-and-in-curving roof of the cave in which you stand. Try to see where the original denizens of the place may have gained entrance. It boggles the imagination. Did they cling to the cliffsides, groping for meager hand and toe holds? Did they use ropes? Crude ladders? A combination? We shall never know. Any such implements have long since returned to dust along with the bones of those who made them. 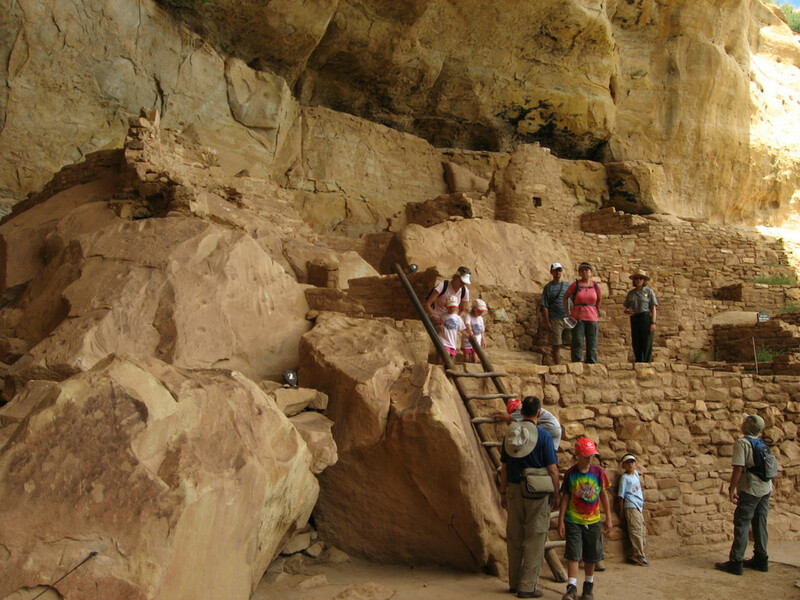 It is estimated that this cliffside dwelling may have housed about 80 people around 1250 C.E. 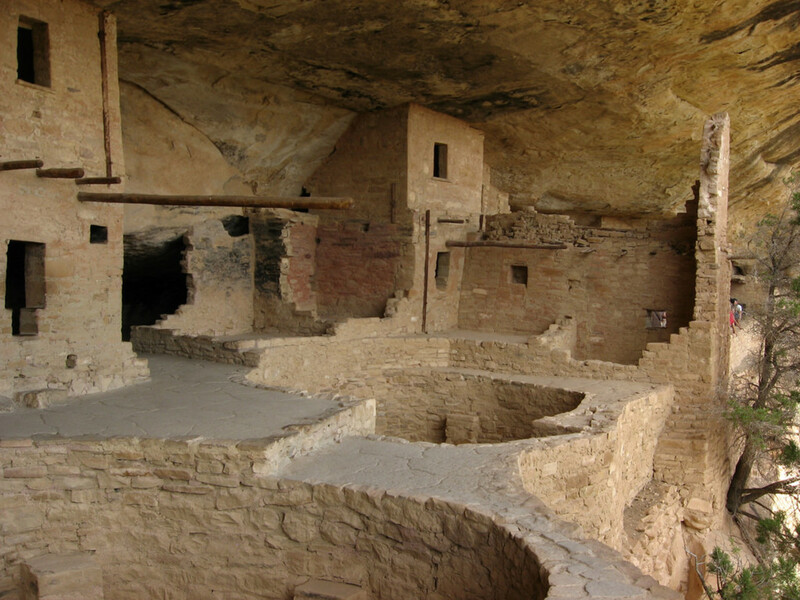 It is the best-preserved of the cliff dwellings. Update: According to park service information, Spruce Tree House is closed for the foreseeable future, due to danger from rock falls. 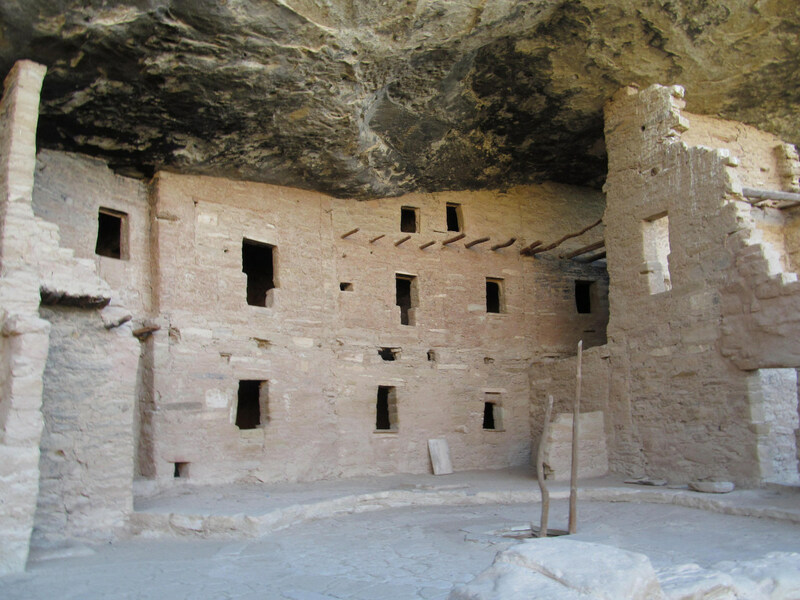 This is the largest of the cliff dwellings. It is estimated that, at its peak, about 300 families lived here. Can you imagine that? Look at how room is upon room, all crowded together; today we complain if we don't have our "personal space." 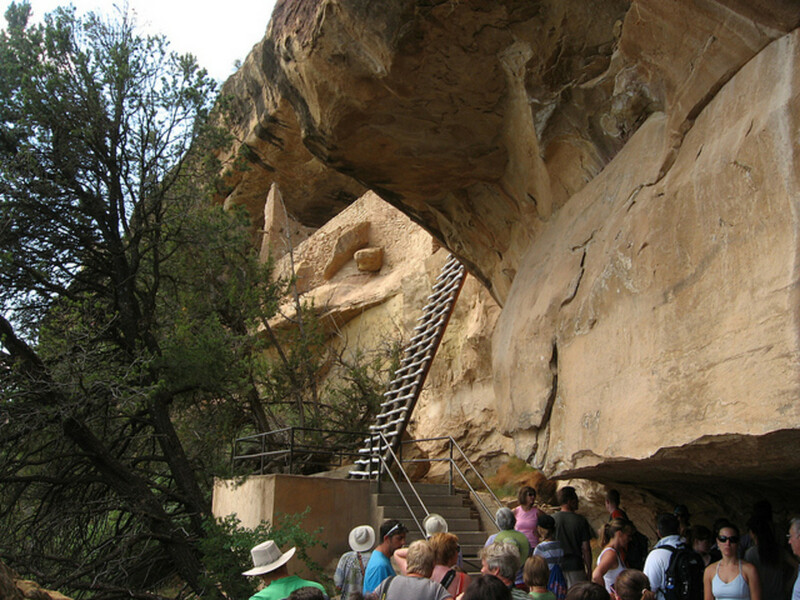 Cliff Palace is accessible by ranger tours only, and there is a fee. Allow plenty of time, for the drive to the meeting place to start the tour is a little over an hour. These structures are on a par with the pyramid builders of ancient Egypt! 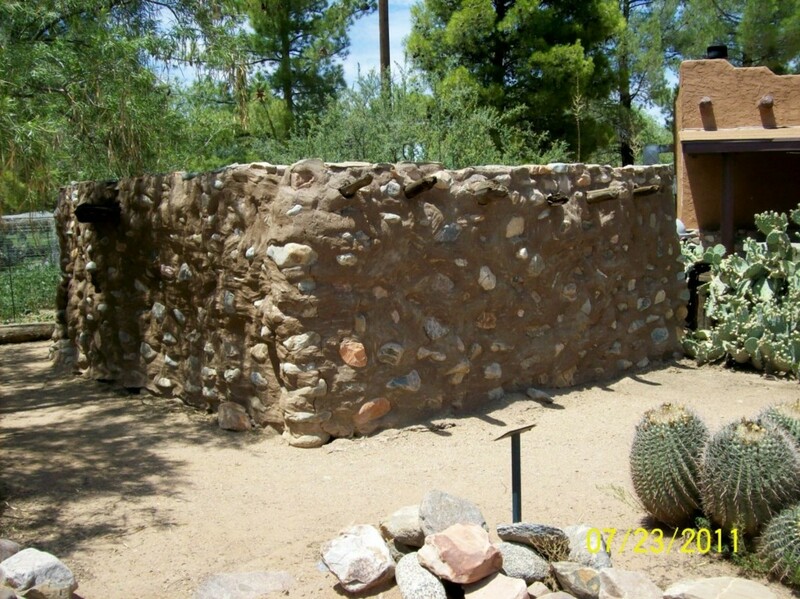 How did they build these abodes minus any kind of modern tools? It would be a challenge even for us, today, for this is no place accessible to bulldozers and other such powerful machines to move rocks and earth. It is amazing what these people of old did to make these cliff-side refuges livable. Carved with brawn and out of intuition, ingenuity, and even desperation, they fashioned huge cave cities—walls, doors, windows, balconies, walkways, even subterranean religious chambers—all the things necessary to their way of life. Yet they possessed no colleges, no professors, no slide rules or higher mathematics. Still and all, upon this lack of formal education, they built cities which have lasted for centuries, preserved in part, ironically, by the very climate which may have driven them out of existence. I wonder if our architects, engineers, and contractors of today, stripped of their tools, could do as well? 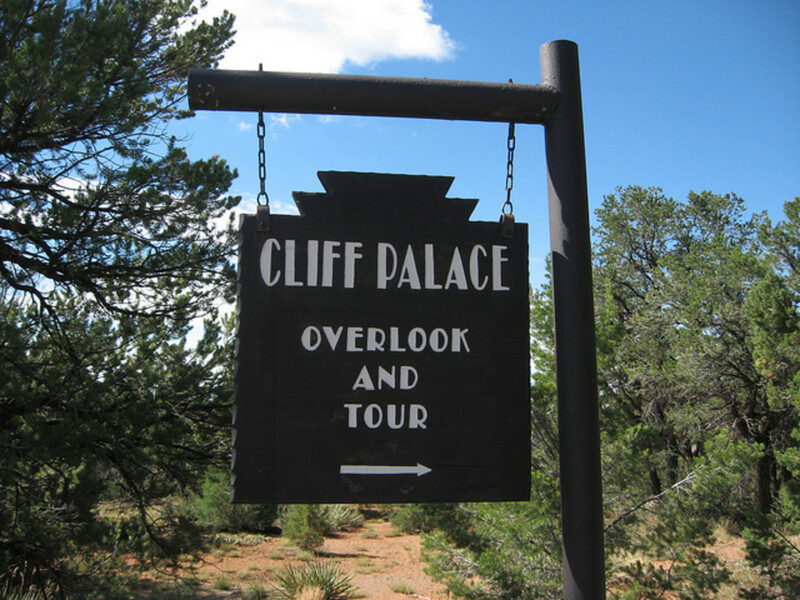 The tour of Balcony House is also ranger-guided only, and a fee applies, with about the same hour's driving time to the meetup spot as with Cliff Palace. Visitors on this tour need to be in good physical shape, as there is a lot of climbing and crawling involved. Once inside, the view is an up-close and personal experience of what it would have been like to live here, for you are in the actual interior of the rooms. The rooms are certainly not very large, and it is a wonder that entire families could exist in such spaces. All of it is accessed by means of steps, massive ladders, and a 12-foot tunnel. It is definitely not a tour for the faint of heart or those who are acrophobic or claustrophobic. 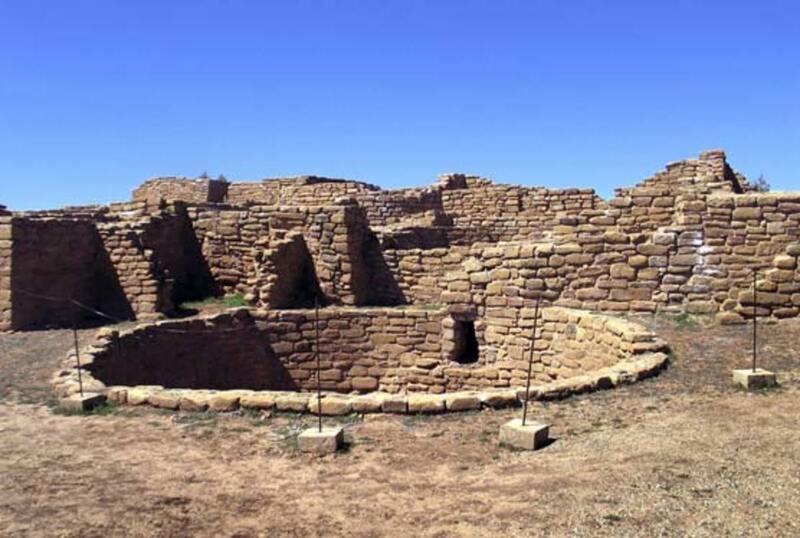 While most of the ancient ruins are located on the main road through Chapin Mesa, there is another road that goes out to Wetherill Mesa. Again, it is about an hour's drive to the parking area. For the Long House tour, a ticket is required, as it is a ranger-guided only tour. Step House is a self-guiding tour, and no ticket is needed. 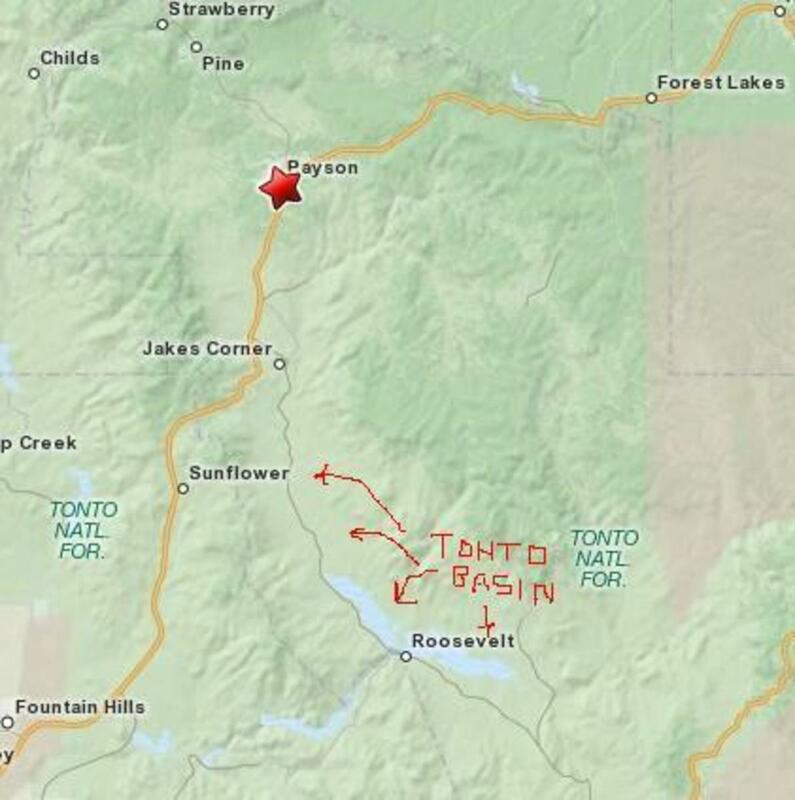 These are two areas I did not get to explore, due to time constraints, but going back is surely on my bucket list. Drive the Ruins Road loop, and see the cliff-top ruins. If you are pressed for time, or are physically challenged, these are the best areas to explore to get some sense of the scale of these ancient structures. Also, there are lookout points where the cliffside dwellings can be seen. The Far View Ruin is the most extensive of the dwelling area ruins. 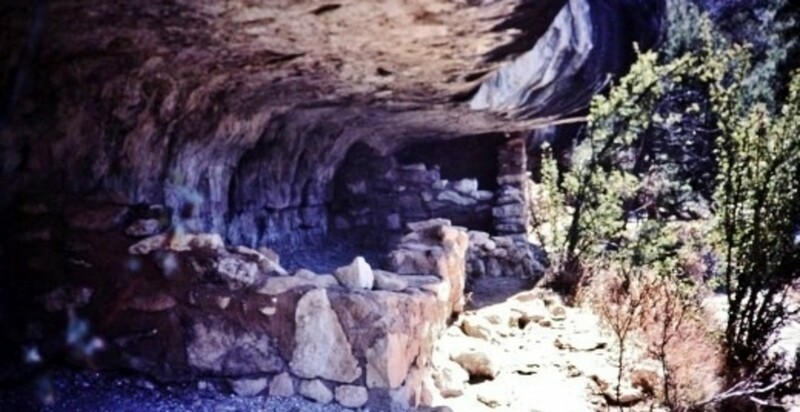 These are the remains of pit-houses, even older than the ancient cliff dwellings themselves. 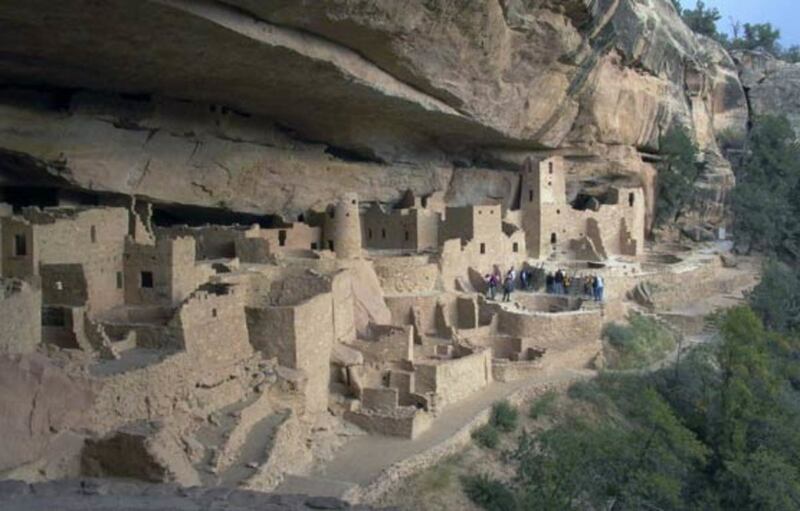 It was from these ancient abodes that the Anasazi fled to the cliffs. Perhaps drought? Perhaps warfare? We are not really sure; there is no convincing evidence of the latter. Perhaps it was a command from their gods. 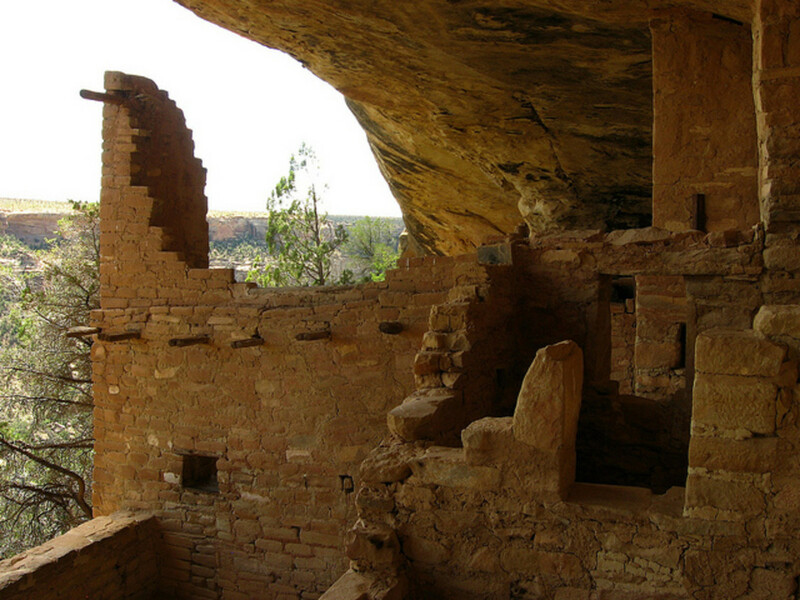 The answer to the question, "Where did the Anasazi go, and why?" has vanished with them from the face of the earth. Also on the Ruins Road Loop is the magnificent Sun Temple, which archaeologists believe was abandoned without ever having been completed. 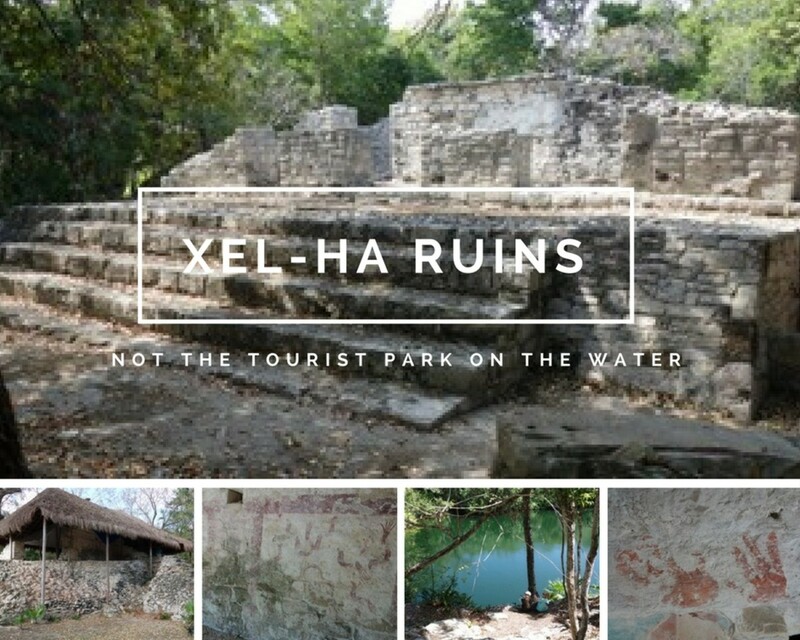 Both of these ruins have been stabilized by modern methods so they may be climbed over, upon and into with safety. There is much activity here--children scrambling about--no doubt oblivious to the significance of that upon which they so joyously clamber. Their parents, somewhat more cognizant, tend to snap photos. 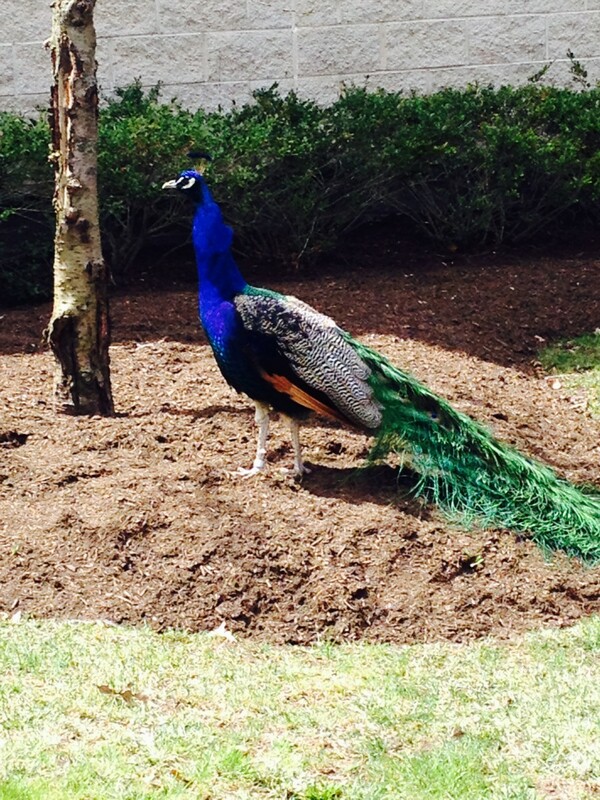 I stood aside from the commotion for a moment and visited the place with my soul as well as my eyes. There is a haunting loneliness here; a sadness pervades all and makes the soul cry out in anguish for what has been lost and can be no more. Even the ghosts are gone now from here. It is empty and sad and still. A tear has sprung, unbidden, to my eye, and I know I have been in communion with the ancient ones, if only for a moment. The shouted discovery of another passageway by one of the children jerked me back to the present, and I, too, began to join the others in pressing shutter buttons, hoping to capture for myself a small piece of what remains. 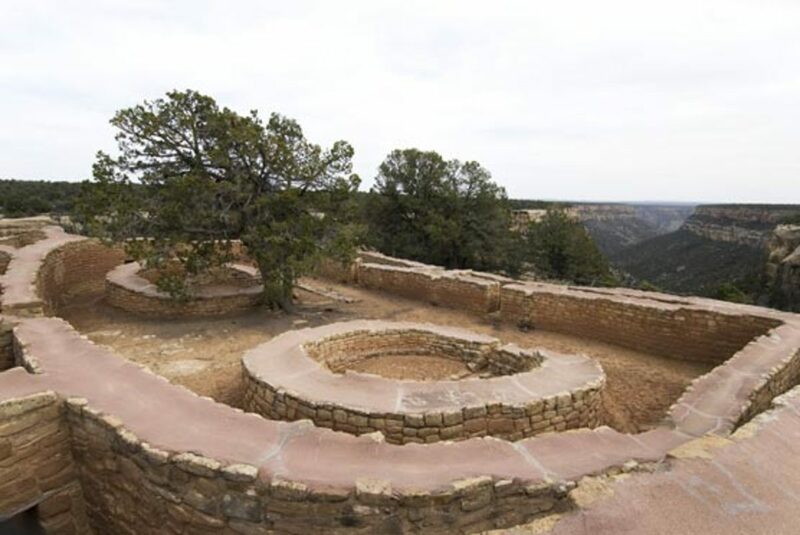 Now, if you ever have a yen to visit our past, do tour Mesa Verde, and please—visit with your heart, and if you find yourself momentarily moved to another level of consciousness, say "hello" to the Anasazi for me. 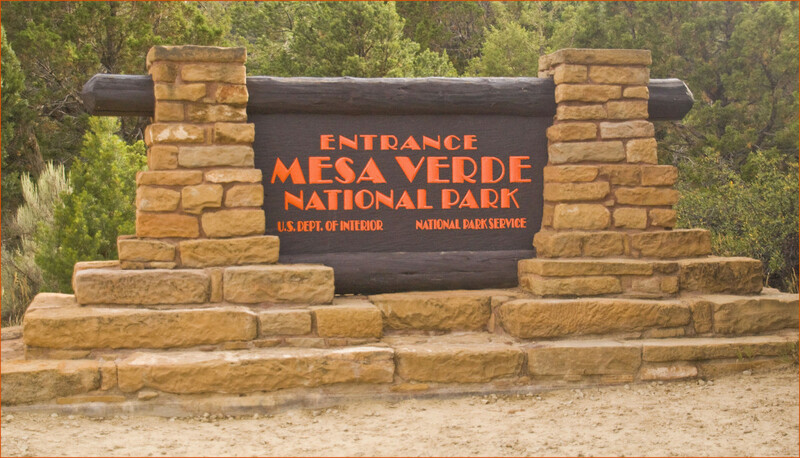 Mesa Verde is open all year, though some areas are seasonal, and road closures in winter may limit or prevent park access. Call ahead to check on weather conditions if you plan a winter visit. Camping is available within the park at Morefield Campground and Village, both of which are fully open from April to October. Primitive camping is also available on a more limited basis. 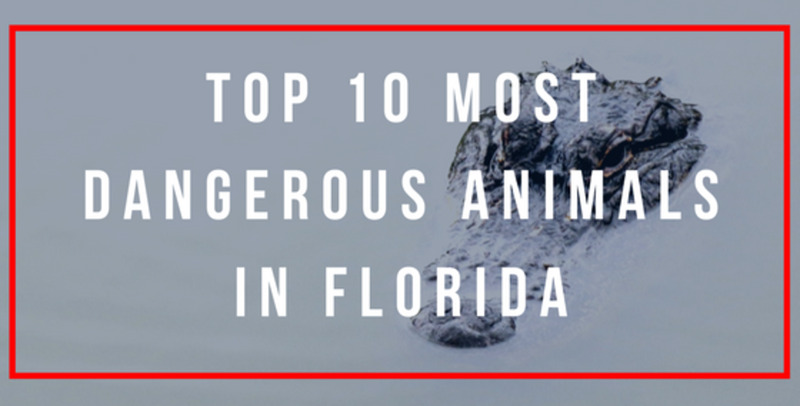 Call the park at 1-800-449-2288 for information. Lodging is available at the Far View Lodge, open from April to October; call the phone number above for specific dates, as these vary year by year. Hotels and restaurants outside the park are available in Cortez, Colorado, ten miles from the park entrance, and in Mancos, Colorado, eight miles from the park entrance, in the other direction. Durango, home of the famous Durango and Silverton Railroad, is 160 miles from the park to the east-northeast. 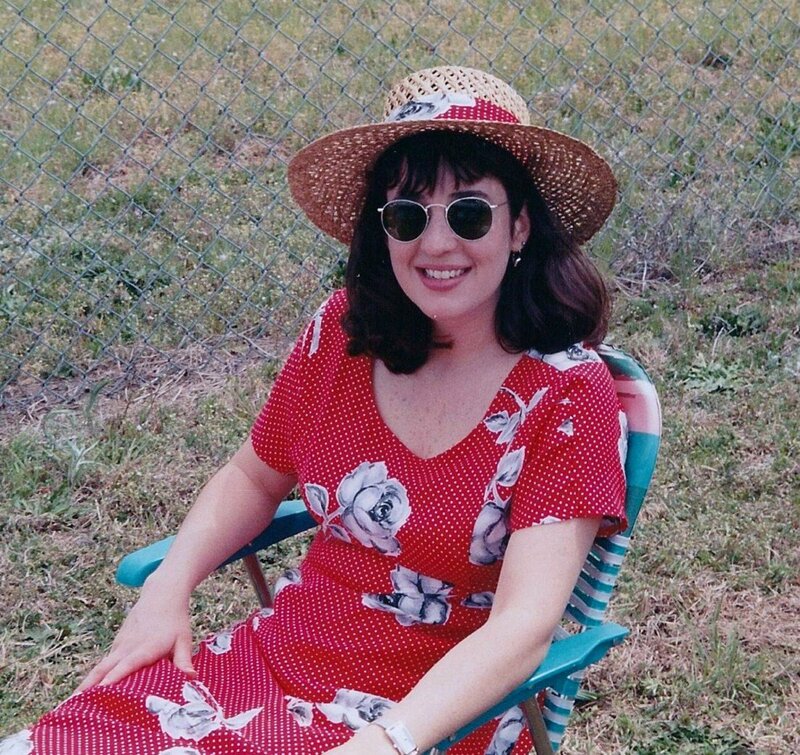 Thanks for stopping by and for your comments. I'm glad you both enjoyed the article. Very well written - you make me want to visit. I congratulate you on the hub. Awesome hub! It was a pleasure reading this, you are a compelling writer, well done.